All Seasons Evergreen® is a Sakata Seed Southern Africa’s proprietary mixture developed specifically for the Southern African region. Many years of trials conducted at our local research station, as well as decades of field experience, have contributed to the success of this mix. This grass mixture will stay green throughout the year no matter how cold it gets! Even frost or snow won’t force the grass to turn brown (go dormant). It is also important to ensure the mixture can cope with the hot times of the year. This is why long term local experimental trials are so important. We need to be sure that this grass looks good all year round. All Seasons Evergreen® is designed to grow in full sun and semi-shade conditions. It is compatible with another Sakata Seed Southern Africa’s grass formulated for full and semi shade, known as Shade-Over®. The combination of All Seasons Evergreen® and Shade-Over® covers the complete spectrum from shade to full sun while maintaining a uniform appearance. It is recommended that an irrigation system be installed when you establish an All Seasons Evergreen® lawn. 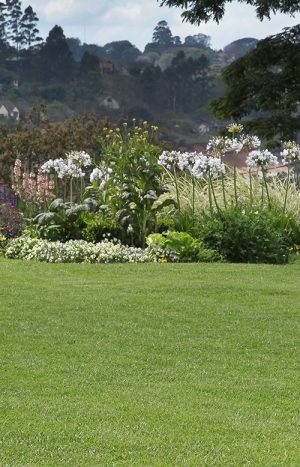 Although it does not need much more water than a Kikuyu lawn, it cannot survive long periods of drought. 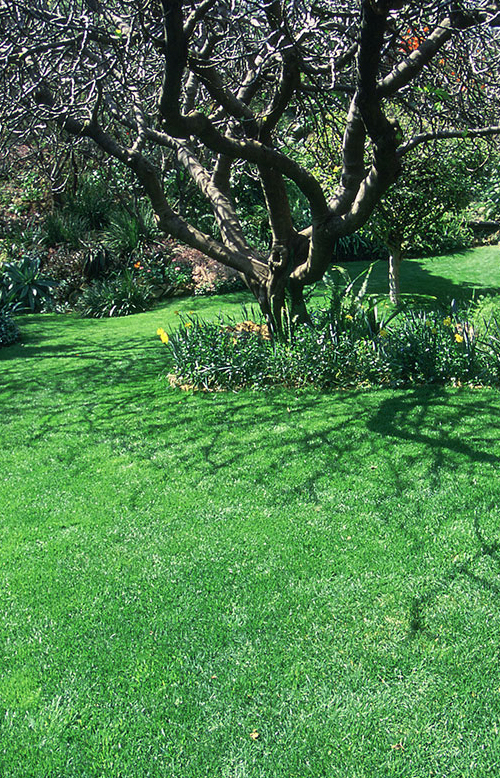 All Seasons Evergreen® is a permanent grass that will only need interseeding if the grass is damaged by something like a dog digging a hole or if it thins out in shady parts as a result of mowing at too low a cutting height. All Seasons Evergreen® tolerates high traffic levels. It is used on rugby stadiums such as in Bloemfontein where busy fixtures schedule has to be accommodated. It is also used on pavements and other walkways. Most important in the domestic situation, All Seasons Evergreen® copes well with the challenge presented by kids and dogs. There is, however, a limit to the amount of traffic any lawn can tolerate. Pathways always develop where traffic is “funneled” through a confined space and the shortest route will carry the most traffic! In certain circumstances dog urine can burn patches in the lawn but these are easily dealt with. 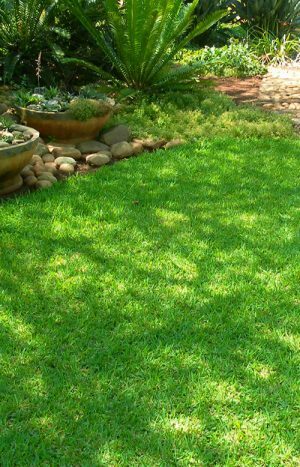 If the area is in full sun and grasses such as Kikuyu were growing there before, it is important to get rid of them properly before establishing a new lawn. The underground runners of creeping grasses can be very persistent so you can’t simply dig it out. It is best to spray the existing grass with a non-selective weed killer. by rolling the area lightly and then filling in any hollows. NB. It is very difficult to correct levels after the grass is established. Bunch grasses do not have runners, but tillers, which cannot be covered by a layer of soil. Start – When grass is 9 cm long. Set the mower at its highest setting (no less than 6cm). 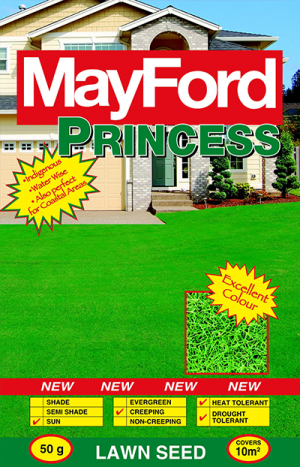 Height – Sunny areas 2 to 5 cm (4 to 5 cm recommended as lower heights necessitates twice weekly mowing). Frequency – Generally once a week (more frequently if cut shorter than 4 cm). Approximately once every three weeks in winter. Type of mower – Rotary mowers are best for this type of grass (Reel type mowers can’t be set high enough). At maturity, irrigate 25 – 30 mm per week in summer (2 or 3 times a week). In very hot weather syringe lightly at noon and 10 – 15 mm per week in winter (1 or 2 times a week). Once the grass has an established root system, the frequency of irrigation should be reduced. You should irrigate thoroughly 2 or 3 times a week making sure that the water gets down at least 6cm. Irrigating daily, but too lightly usually results in too much moisture at thye surface and not enough in the root zone. The best times to irrigate are at night or in the morning. The worst time to irrigate is in the evening, because this extends the “Dew Period”, and keeps the leaves wet for too long a period. This can cause problems with fungal diseases. However, if the evening is the only available time, then it is better to water then than not at all! The top of extreme slopes dry off very quickly. The grass needs water when it is has a blue-ish tinge and the leaf blades curl inwards. 50 g (approximate one handful) per m² of 5:1:5 or 3:1:5 four times a year (e.g. Jan, Apr, Jul, Oct). Don’t forget the April application to avoid brown tips in winter.Slow release formulations are recommended as lawns do best when fertilised little and often. If a brown patch develops, pull the dead grass out, loosen the soil a bit , sprinkle some seed (available in small Top Up packs at most nurseries), cover with a thin layer of soil (just scratch it in) and trample lightly under foot. This is less of a pain than continuous edge trimming Kikuyu, as long as you aren’t trying to keep four Alsatians on 100 m² of lawn!